I have spent the last 6 years of my life in the tech startup scene; and a huge part of it was in the tech startup scene as an intern in a tech development firm, an investment associate in a tech startup investment firm, and a founding team member of an edu-tech startup. One thing I've learnt from the tech startup industry is the collaborative nature of it from open communities, co-working spaces, and even open-source codes and free softwares. This has undoubtedly helped to spur the industry to grow at an unprecedented pace over the last few years, putting Singapore very quickly (and largely) on the global tech startup map. So a couple of months ago I had this big audacious idea: could I put Singapore on the global beauty map as well by creating a similarly close-knit and collaborative community of beauty entrepreneurs right here in Singapore? It was a passion project (and still is) so I haven't been able to do much but I managed to organise a mini-beauty convention with the idea that it could be a marketing event to just let other Singaporeans know that local beauty brands actually exist. The reception from the public was, unfortunately, not that great. And I blame myself for probably not marketing the event well enough. But the connections and networks between the beauty brands at my convention was just plain awesome! 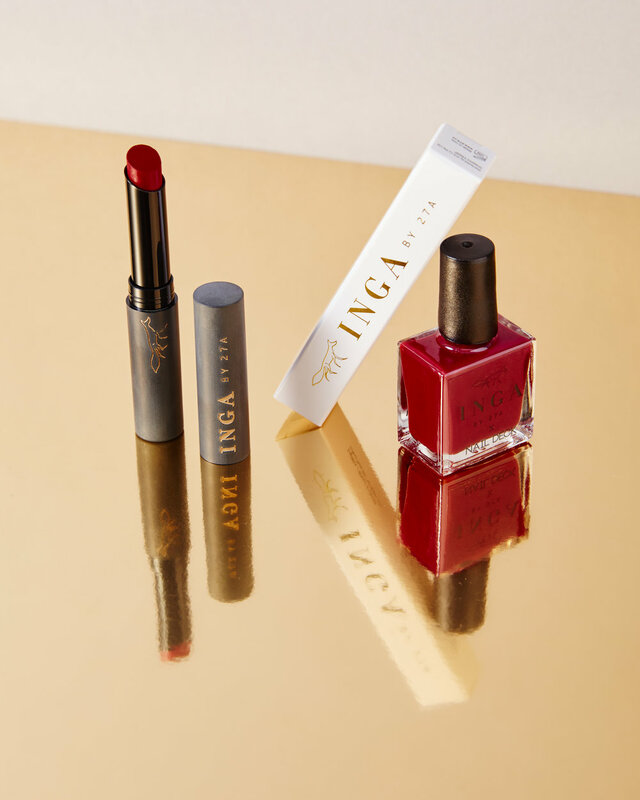 Two of the companies organised a trip up to the Malaysians Beauty Expo together and for myself I managed to connect with local lipstick brand INGA to release a collaboration collection! I hope that this will be the first of many more collaborations that local beauty brands can do to help each other grow to the next level. Every single beauty founder I met at the beauty convention had been working in silo, on their own, for years! Most have maintained at the 'family business' stage where they are still making small batches and selling their products on their own through bazaars, events and their own online stores. Most don't have employees and mainly rely on help from family and friends. Now Nail Deck is far from being a stellar success yet and to be very honest it's also still stuck in this 'family business' stage but I do hope that by working on building this community, I can help both others and myself! 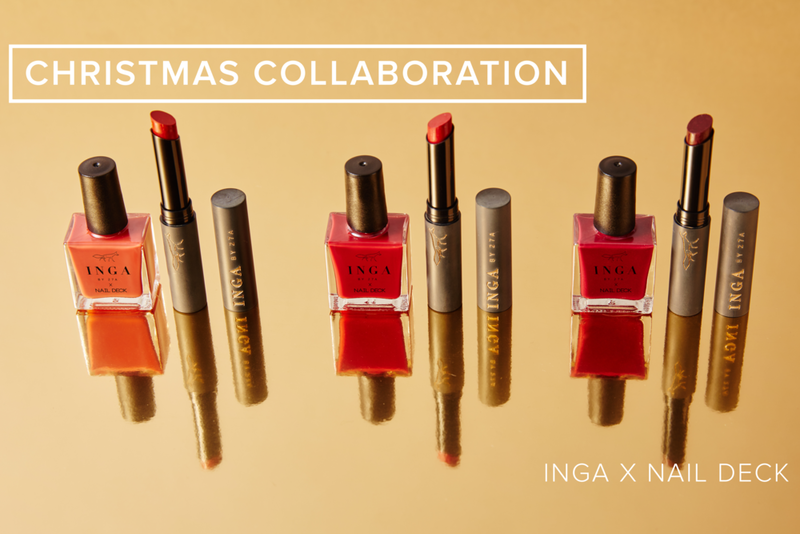 If you want to support TWO local beauty brands, get a bunch of great quality nail lacquers and lipsticks catered to the Asian skin and climate, shop our Christmas Special collection here! How many manicures can you get with one bottle of nail polish? So if you've been following my previous posts, a lot of my blog posts are inspired by questions posed to me by my customers. This post is no different! I get this question a lot and for the life of me, I don't know why I took 6 years to find out the answer for myself. I have asked manicurists from salons and those who work from home. I have asked nail bloggers and influencers. I have asked my wife and my sisters. Last week I was doing my usual pop-up event at SIA and upon hearing me promote my matte top coat, one of my customers said "hey but why should I buy yours when I can just make it on my own?" Fair statement. And it got me curious. I decided to do some research to find out how to do it on my own as well and found that Googling 'diy matte nail polish' yielded a surprisingly large number of articles and tutorials on how to do it! This involves baking powder (obviously), a tightly-woven sifter, a small dish, and a small, soft makeup brush. You've got to sift the powder to avoid any clumps. You've got to brush the baking powder onto your wet nails but you also have to make sure that the brush is fully covered with baking powder to avoid ruining your wet polish. You've got to make sure the brush is soft enough so that it won't cause streaks in your manicure. You've got to leave it for a few minutes to let the baking powder sink into the nail polish. Then you've got to make sure you don't leave the baking powder on too long or it'd dry into the nail polish causing specks of powder to show. I don't know though; to me painting on nail polish is already such a chore. This seems to make the entire process 9319163x more troublesome. P.S. I thought it was quite funny how the last step stated (rephrased) was 'Avoid using a glossy top coat. If you can find a matte top coat, use that instead'. WHY would you go through the trouble of doing all that if you already have a matte top coat though? If high gloss is classy, then matte is its alternative and adventurous cousin. Cuticle oil smells really good. But is that all it's good for? I apply cuticle oil on my nails just so that I can smell them all day. Yup, that’s me. The creepy guy on the train sniffing his freshly scented cuticle oil-ed fingertips. But what else is there to cuticle oil besides its glorious smell? I did some research and reading online and compiled the following! The cuticles are like the protectors of our nails and when they are in a good condition, it helps the nail to grow stronger and more healthily. Although it's called cuticle oil, a common misconception is that it's only meant for the cuticles. In fact you can apply it on your nail as well! The small molecules of the oil are able to penetrate the deeper layers of the nail to condition and soften it. The larger molecules stay closer to the surface and help condition the upper layers. As the solvent in nail polish evaporates over time, the polish coating can turn brittle. Cuticle oil prevents evaporation and acts as a stand-in plasticiser of sorts and keeps the polish from becoming brittle! So there you go! Great smelling and useful. What else is there to ask for! Base coat > top coat? It's conventionally known that top coats are to protect your nail polish from chipping; and base coats are to prevent dark coloured nail polish from staining your nail beds. In addition I've found that base coats form a good foundation to 'smoothen' out any uneven 'ridges' on your nail surface so that your applied nail polish won't be streaky. 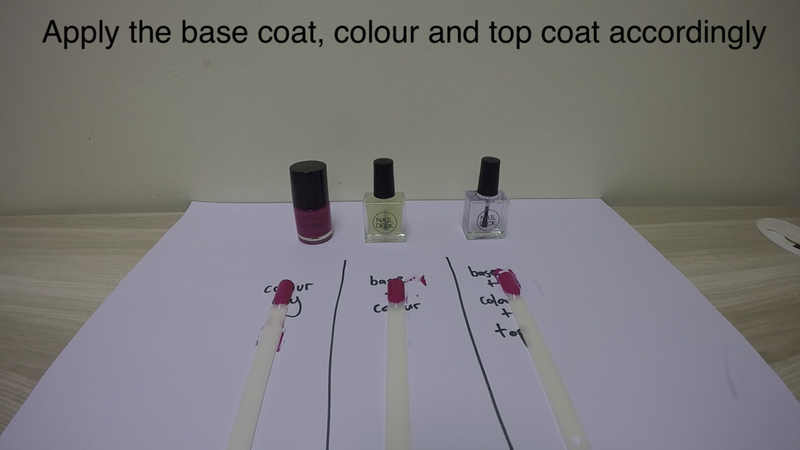 But while I was writing about quick dry top coats last week, I chanced upon an article that mentions how base coats are meant to make your nail polish more chip resistant and last longer too! It works sort of like a primer that allows the nail polish to 'stick' on better. I've been having quite a bit of fun with running experiments so I decided to do another one this week! I did a video recording of it but as I was editing it I found it to be quite dry. So here are some screen shots instead! First I created 3 test palettes - one with just the colour applied; one with a base coat applied below the colour; and one with top coat applied on top of the colour and base coat. After letting the palettes dry completely, we soak them into some nail polish remover. The results after 15 minutes! To be very honest, I only saw a very slight different between 'Colour only' and 'Base + Colour'. But the difference between 'Base + Colour' and 'Base + Colour + Top' was as expected, very large! The palette with the top coat was almost not affected by the polish remover. But then again is soaking the test palettes into nail polish remover a good way to test whether base coats are really good at fighting nail polish chipping? Let me know and I'll be glad to try and test it out! How quick is our quick dry top coat? Customer: Hey so this makes my nails dry faster, right? Customer: How long does it take to dry? Me: Er.. it’s better than a normal top coat so it should dry pretty fast! Fortunately for me she was a kind customer and proceeded to purchase it anyway. But I couldn’t stand not knowing the exact answer to her question. So I decided to put some of secondary school science background to good use to conduct a simple experiment to find out! Save time today! Get yours here. Have you heard of the Dark Vampire Blood Red? Back in 2011, I started Nail Deck as a retailer of 15 brands of nail polish. And yes, I’m a guy. Many friends (and customers) kept asking why I was running such a female-oriented business; others assumed I was just helping my girlfriend out. To answer all of them (and myself), I wrote a blog post about it; and till today I still go back to it every now and then to remind myself why I am doing what I am doing. What does this have to do with the dark vampire blood red? I’m glad you asked. In the early days of the business, a customer asked me if I had the dark vampire blood (DVB) red. Back then I was still this clueless guy fumbling around trying to understand why women needed so many bottles of nail polish. But this seemingly simple request changed my (and Nail Deck’s) life. It dawned upon my typical male mind that the world of colours was much more than just the generic black, white, red, green, blue and yellow. What’s a dark vampire blood red anyway? I will never know because of all the bottles of red nail polish I brought out for her to view, none of them met her criteria. She walked away empty handed. And this was just the start of many more colour-specific requests I received on a daily basis. "At Nail Deck, we only want you to get the colours you really want and that you'd use over and over and over again. For example, you might be looking for a particular red from OPI. Here at Nail Deck, we will show you that red you were looking for, but we will also show you all the other similar reds from Essie, China Glaze, Orly, Butter London, Deborah Lippmann, etc because we want you to be really sure that the red you end up taking home with you is really the kind of red that you want (because we all know a slightly different shade of red can make a world of a difference)." Today, 5 years later, Nail Deck promises the same level of dedication to helping you find the right colour except we’ve launched our own brand (of the same name) and we will customise a colour just for you even if you’re only ordering 1 bottle! In addition, we've created the DVB red; or at least what I think the DVB red is. I’ve decided that it shall be the signature colour of Nail Deck to always remind and represent the humble beginnings of this company. It might not be the exact same shade of red that customer requested for, and I don’t think I will ever know what the real DVB red looks like, but this is my best attempt at creating the colour that I hope will impact your life as it has impacted mine.